The word "landscape" entered the modern English language as landskip (variously spelt), an anglicization of the Dutch landschap, around the start of the 17th century, purely as a term for works of art, with its first use as a word for a painting in 1598. 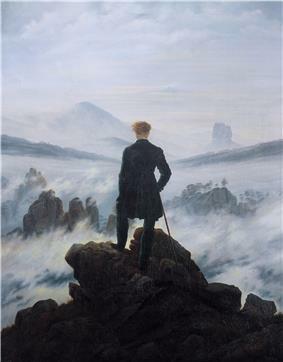 Within a few decades it was used to describe vistas in poetry, and eventually as a term for real views. However the cognate term landscaef or landskipe for a cleared patch of land had existed in Old English, though it is not recorded from Middle English. 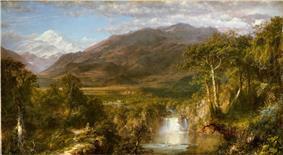 Landscape views in art may be entirely imaginary, or copied from reality with varying degrees of accuracy. If the primary purpose of a picture is to depict an actual, specific place, especially including buildings prominently, it is called a topographical view. 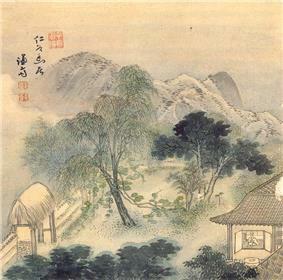 Such views, extremely common as prints in the West, are often seen as inferior to fine art landscapes, although the distinction is not always meaningful; similar prejudices existed in Chinese art, where literati painting usually depicted imaginary views, while professional court artists painted real views, often including palaces and cities. During the 14th century Giotto di Bondone and his followers began to acknowledge nature in their work, increasingly introducing elements of the landscape as the background setting for the action of the figures in their paintings. Early in the 15th century, landscape painting was established as a genre in Europe, as a setting for human activity, often expressed in a religious subject, such as the themes of the , the Journey of the Magi, or Saint Jerome in the Desert. Luxury illuminated manuscripts were very important in the early development of landscape, especially series of the Labours of the Months such as those in the Très Riches Heures du Duc de Berry, which conventionally showed small genre figures in increasingly large landscape settings. A particular advance is shown in the less well-known Turin-Milan Hours, now largely destroyed by fire, whose developments were reflected in Early Netherlandish painting for the rest of the century. The artist known as "Hand G", probably one of the Van Eyck brothers, was especially successful in reproducing effects of light and in a natural-seeming progression from the foreground to the distant view. 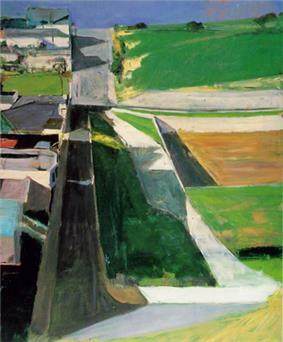 This was something other artists were to find difficult for a century or more, often solving the problem by showing a landscape background from over the top of a parapet or window-sill, as if from a considerable height. 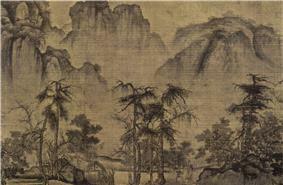 Landscape backgrounds for various types of painting became increasingly prominent and skilful during the 15th century. 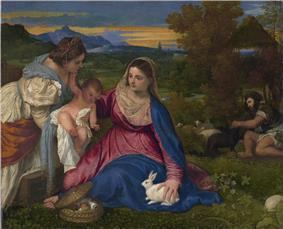 The period around the end of the 15th century saw pure landscape drawings and watercolours from Leonardo da Vinci, Albrecht Dürer, Fra Bartolomeo and others, but pure landscape subjects in painting and printmaking, still small, were first produced by Albrecht Altdorfer and others of the German Danube School in the early 16th century. 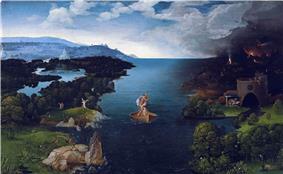 At the same time Joachim Patinir in the Netherlands developed the "world landscape" a style of panoramic landscape with small figures and using a high aerial viewpoint, that remained influential for a century, being used and perfected by Pieter Brueghel the Elder. 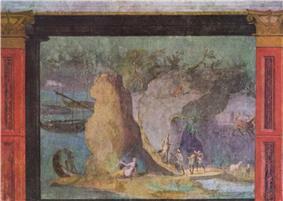 The Italian development of a thorough system of graphical perspective was now known all over Europe, which allowed large and complex views to be painted very effectively. 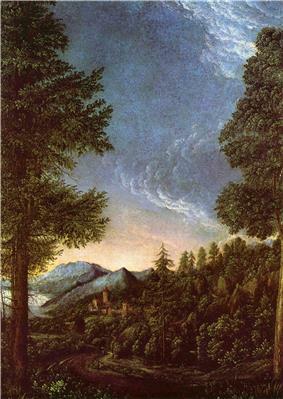 Landscapes were idealized, mostly reflecting a Titian, and remained associated above all with hilly wooded Italian landscape, which was depicted by artists from Northern Europe who had never visited Italy, just as plain-dwelling literati in China and Japan painted vertiginous mountains. 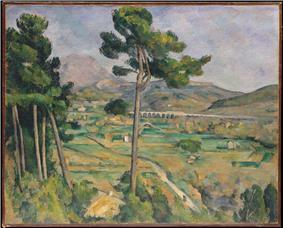 Though often young artists were encouraged to visit Italy to experience Italian light, many Northern European artists could make their living selling Italianate landscapes without ever bothering to make the trip. Indeed, certain styles were so popular that they became formulas that could be copied again and again. 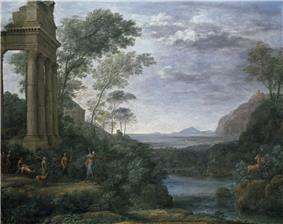 Compositional formulae using elements like the repoussoir were evolved which remain influential in modern photography and painting, notably by Poussin  and Claude Lorrain, both French artists living in 17th century Rome and painting largely classical subject-matter, or Biblical scenes set in the same landscapes. 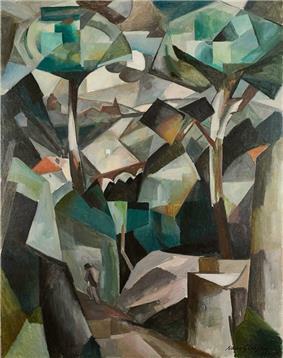 Unlike their Dutch contemporaries, Italian and French landscape artists still most often wanted to keep their classification within the hierarchy of genres as history painting by including small figures to represent a scene from classical mythology or the Bible. Salvator Rosa gave picturesque excitement to his landscapes by showing wilder Southern Italian country, often populated by banditi. 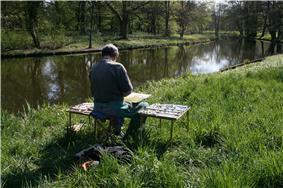 The Dutch tended to make smaller paintings for smaller houses. 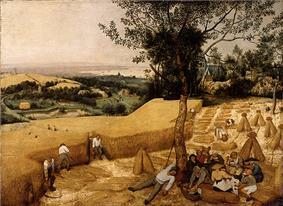 Some Dutch landscape specialties named in period inventories include the Batalje, or battle-scene; the Maneschijntje, or moonlight scene; the Bosjes, or woodland scene; the Boederijtje, or farm scene, and the Dorpje or village scene. 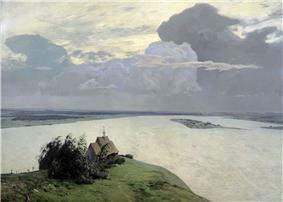 Though not named at the time as a specific genre, the popularity of Roman ruins inspired many Dutch landscape painters of the period to paint the ruins of their own region, such as monasteries and churches ruined after the Beeldenstorm. 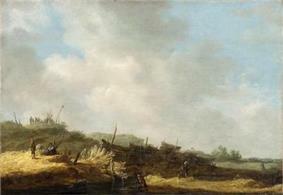 Jacob van Ruisdael is considered the most versatile of all Dutch Golden Age landscape painters. 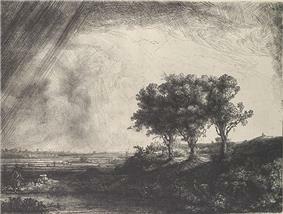 The popularity of landscapes in the Netherlands was in part a reflection of the virtual disappearance of religious painting in a Calvinist society, and the decline of religious painting in the 18th and 19th centuries all over Europe combined with Romanticism to give landscapes a much greater and more prestigious place in 19th-century art than they had assumed before. 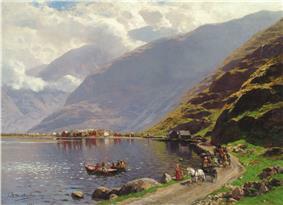 In England, landscapes had initially been mostly backgrounds to portraits, typically suggesting the parks or estates of a landowner, though mostly painted in London by an artist who had never visited his sitter's rolling acres; the English tradition was founded by Anthony van Dyck and other mostly Flemish artists working in England. In the 18th century, watercolour painting, mostly of landscapes, became an English speciality, with both a buoyant market for professional works, and a large number of amateur painters, many following the popular systems found in the books of Alexander Cozens and others. 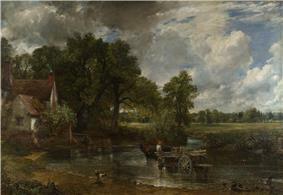 By the beginning of the 19th century the English artists with the highest modern reputations were mostly dedicated landscapists, showing the wide range of Romantic interpretations of the English landscape found in the works of John Constable, J.M.W. 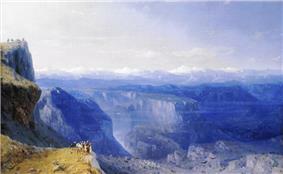 Turner and Samuel Palmer. 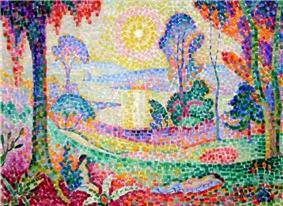 However all these had difficulty establishing themselves in the contemporary art market, which still preferred history paintings and portraits. 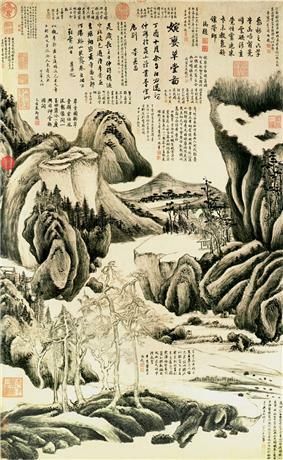 The 18th century was also a great age for the topographical print, depicting more or less accurately a real view in a way that landscape painting rarely did. 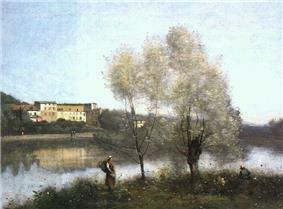 Initially these were mostly centred on a building, but over the course of the century, with the growth of the Romantic movement pure landscapes became more common. 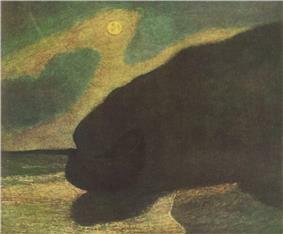 The topographical print, often intended to be framed and hung on a wall, remained a very popular medium into the 20th century, but was often classed as a lower form of art than an imagined landscape. 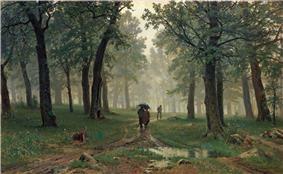 Landscapes in watercolour became a distinct specialism, above all in England, where a particular tradition of talented artists who only, or almost entirely, painted landscape watercolours developed, as it did not in other countries. 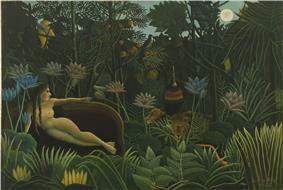 The paintings sold relatively cheaply, but were far quicker to produce. 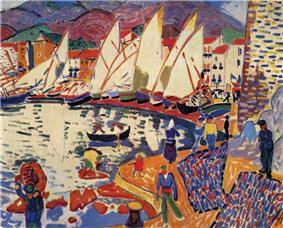 These professionals could augment their income by training the "armies of amateurs" who also painted. 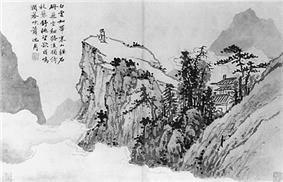 Japanese art initially adapted Chinese styles to reflect their interest in narrative themes in art, with scenes set in landscapes mixing with those showing palace or city scenes using the same high view point, cutting away roofs as necessary. 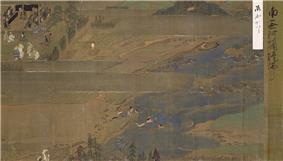 These appeared in the very long yamato-e scrolls of scenes illustrating the Tale of Genji and other subjects, mostly from the 12th and 13th centuries. 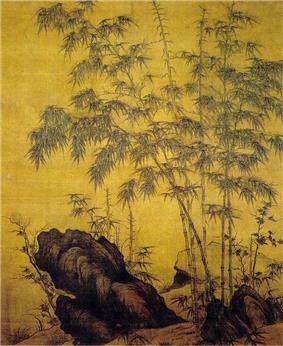 The concept of the gentleman-amateur painter had little resonance in feudal Japan, where artists were generally professionals with a strong bond to their master and his school, rather than the classic artists from the distant past, from which Chinese painters tended to draw their inspiration. 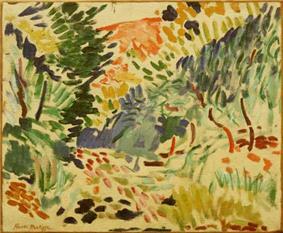 Painting was initially fully coloured, often brightly so, and the landscape never overwhelms the figures who are often rather over-sized. 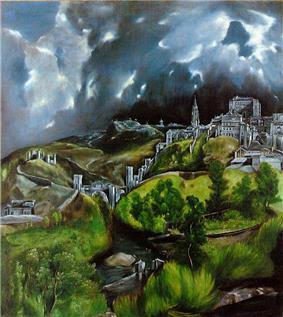 El Greco, View of Toledo c. 1596–1600, oil on canvas, 47.75 × 42.75 cm, Metropolitan Museum of Art, New York, is one of the two surviving landscapes of Toledo painted by him. 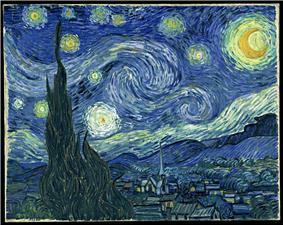 The aggressive paint handling in the sky prefigures 20th century Expressionism. 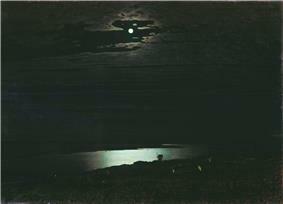 Archip Kuindshi, Night on the Dnieper River 1882. 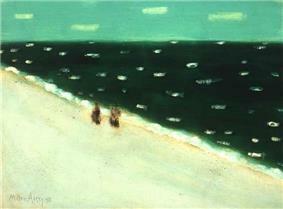 Milton Avery, Green Sea 1958, a painting at lands end. moonscapes of Nancy Graves, or the aerial cityscapes of Yvonne Jacquette. 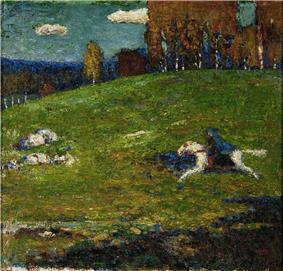 Wassily Kandinsky Der Blaue Reiter 1903. 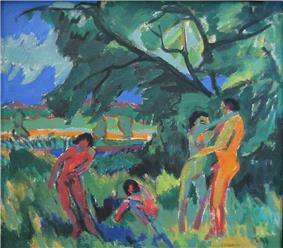 Der Blaue Reiter, an Expressionist group active from 1911–1914. 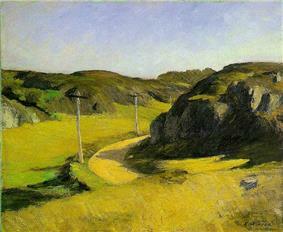 Edward Hopper, Road in Maine, 1914. 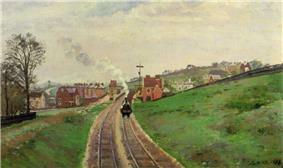 Associated with American realism and members of the Ashcan School. ^ Seno, Alexandra A. (2010-11-02). 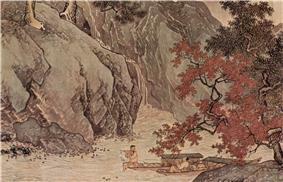 River of Wisdom' is Hong Kong's hottest ticket"'". Fong, Wen C.; et al. (2008). 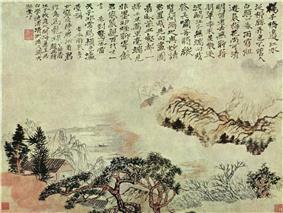 Landscapes clear and radiant: the art of Wang Hui (1632-1717). New York: The Metropolitan Museum of Art.